When I was surfing the web I came across this device. It is an easy way to make your fingerworks device wireless. I wonder how long the battery will last. It says it can go up to 120 mA. •Works with the following devices: iPhone/iPad, Android phones and tablets, Windows XP/7/8 laptops/tablets. 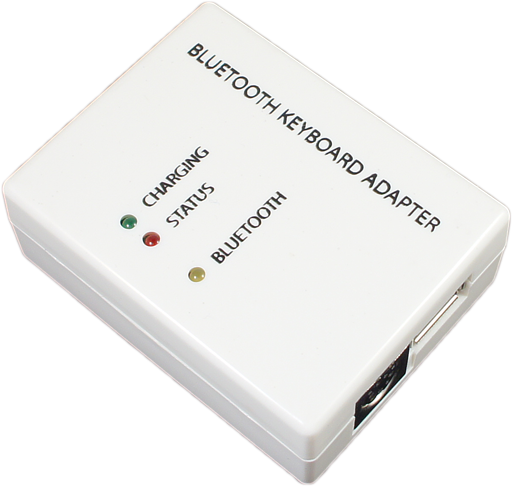 Note you phone/tablet/pc must support Bluetooth keyboard. Many low-end phones do not. Currently the adapter does NOT work with Mac. Let us know if Mac support is really important to you. •Mini USB cable is included. Wall charger is NOT included. You can use any standard USB charger or plug it into a PC to charge the battery. That's pretty cool. I wanted something like that for a long time when I was using my Touchstream on a homemade "tent" on my lap. I really wanted to be able to have freedom to swivel around in my chair without being constrained by the cord. For quite a while now, I've been using my TS flat on my desk with a long ribbon cable. The pads have about a 12 inch separation right now as I'm typing on them. Using that bluetooth device might make it possible to mount the pads of the TS to the arms of a chair. That could be nice. At the moment I use two touchstreams one for each hand. I attached them to my chair and I'm planning to make it wireless. Bought a wireless usb hub but it still needs a battery to make it wireless. Also it has some glitches so maybe this bluetooth adapter is a good option.